Touchdown! Rocco gets ready for #SuperDogSunday! This Sunday, millions of Americans will be camped out in front of their televisions, ready for the big game. But what about your pups? Are they Super Bowl ready? Here are some tips to help get your dogs ready for game day, whether you're expecting a house full of guests or are looking for ways to get your dog in the game with super conditioning and training tips. 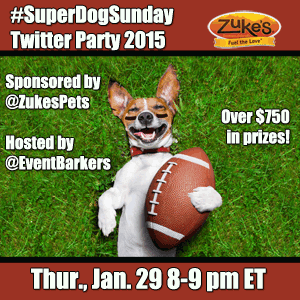 Then, read all the way down for details on the #SuperDogSunday Twitter party, with even more game day tips and a chance to win healthy training treats from Zuke's! You wouldn't step onto the gridiron without first learning to block and tackle and performing basic conditioning drills. Dogs need basic conditioning and training to lead a healthy, happy life and get in the game, too! We love tricks training for both physical and mental stimulation, and the conditioning benefits too. Train sit pretty to strengthen your pup's core and improve balance and stability. Hold a tasty treat like Zuke's Mini Naturals just above and behind your dog's nose to encourage the action. Gradually, ask your dog to hold the position longer and longer, treating at each step of the way. Dogs need to stretch to maintain good flexibility just like we do. Try a "cookie stretch" using Zuke's Genuine Jerky. With a longish piece of the jerky (and your dog in a stand position) lure your dog's head back to his tail and down to his rear leg. 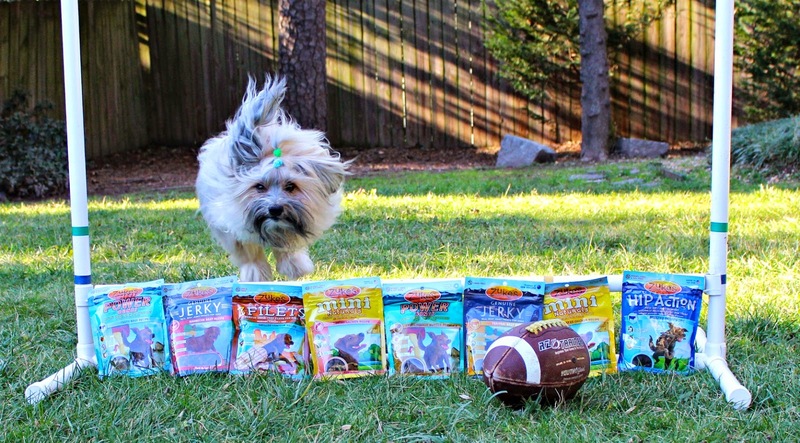 Allow your dog to munch on the jerky while holding the position for a count of five. Repeat on the other side. Rocco sits pretty for a tasty Zuke's treat, made in the USA with wholesome wholefood ingredients. Hide and Seek. We have LOTS of variations on this game, but my favorite is where I hide and Rocco comes to find me. This is a multi-part game that provides fun AND training. First, I send Rocco to his travel bag where HE hides. I tell him to stay and I go hide somewhere in another room. Then, I release him (I have to yell so he can hear me!) and ask him to find me! I start with easy hiding places like behind the sofa and advance to harder places like behind a bathroom door. Rocco is a PRO at this game! Find It. Another variation of hide and seek, hide a treat-stuff toy and send your dog to find it! Or, hide treats in the backyard grass. Use Zuke's Power Bones to keep your dog energized and ready for more games! Box Games. You can never have too much fun with a box! Your dog gets in it, on it, tips it, finds treats in it... the opportunities for fun are endless! More tricks! Not only can some tricks provide good conditioning exercise, they're also fun for entertaining your guests. We like a walking leg weave for a little exercise for both you and your pup. 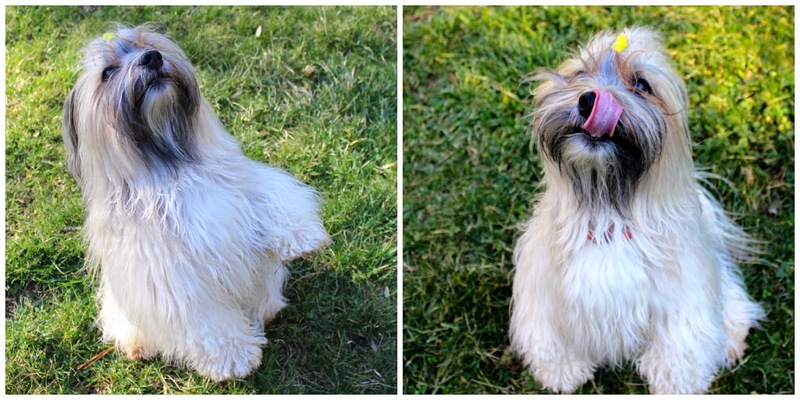 While doing walking lunges, lure your dog though your legs with a tasty treat. One of our favorite tricks, and a crowd favorite, is hide your eyes... great for a good shoulder stretch, too. Try using Zuke's Z-Filets, easy to break into tiny pieces for lots of training fun! Rocco gets a good workout while posing for photos! Depending on your dog's personality, a house full of guest may be either overwhelming or over stimulating. Here are two ways to keep your dog happy and calm when guests arrive. If your dog is shy or fearful, provide a safe and comfortable place away from all noise and excitement. Many dogs are most comfortable in their crates and will be happier resting in a separate room away from the party activities. Provide your pup with a treat-stuffed toy to help keep them occupied. If your dog gets overly excited every time the doorbell rings, try mat training to help your dog relax and stay calm when visitors stop by. With a mat or cushion placed near the door, reward your dog with a healthy treat for going to his mat when the door bell rings. Since you'll want to practice with the sound of the doorbell, enlist the help of family or friends to come to the front door and ring the bell. Or, practice on your own with the help of a wireless doorbell, where you control the ring from the (unmounted) doorbell button. Exercise will help your dog relax at home too, and daily walks as well as backyard fetch and retrieve games can provide a great outlet for excess energy. 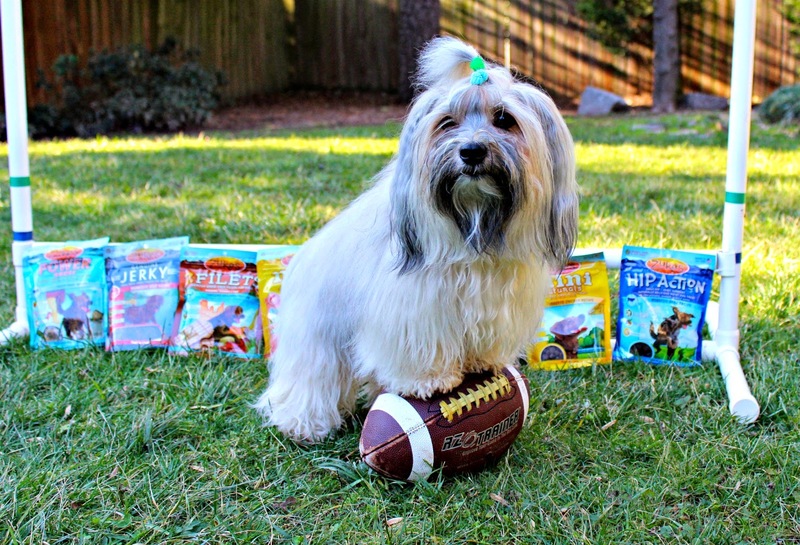 For more tips on helping your dog get game day ready, join us at the #SuperDogSunday Twitter Party with Zuke's this Thursday, Jan. 29 from 8-9 p.m. ET. We'll be celebrating our dogs with ideas to get your dog in the game -- activities for a doggone good day -- AND giving away more than $750 in healthy, USA made Zuke's treats, perfect for rewarding your own super dog! Find out more about the #SuperDogSunday Twitter party and be sure to RSVP for a chance to win a pre-party prize. We are working with Zuke's through our partnership in Event Barkers to produce this Twitter party and share product news with our readers. Prizes will be provided and shipped by Zuke’s. At To Dog with Love, we only share information we believe in. All opinions expressed herein are our own. Great activities and lovely pictures. What fun activities! And I like the idea of mat training. One of my clients is struggling with her dog reacting to the doorbell. Despite all the training she has done, and I when I'm pet sitting, there's not a lot of progress. I'll suggest the mat to her. Have you heard about Deanna's / K-9 CarryAll line of 12th Pup products? Jerseys, bandanas, cheerleading uniforms, etc.for pets. They're darling. Of course! Kona and Rocco are old buddies! K-9 CarryAll has some great stuff! Regarding mat training, it's a great way to teach your dog to relax and not react. Hope it helps for her. Key is to be consistent and train in short spurts several times a day. The results are worth it!